The Senate tax bill is expected to add $1 trillion to the deficit over 10 years. On Thursday, Congress’ nonpartisan Joint Committee on Taxation found that the Senate tax bill will add $1 trillion to the deficit over the next 10 years. Thursday’s report is the first official congressional analysis to use a “dynamic score” that takes into account the tax bill’s likely impact on the economy. Republicans have argued that their $1.4 trillion tax cut will pay for itself by boosting economic growth, and in turn eventually increase tax revenue. Multiple nonpartisan groups have found that the Republican tax bills would not come close to paying for itself, and hardly any economists believe the GOP claims. Now a congressional body that Republicans and Democrats frequently cite as an authority has backed that up. In a letter to Sen. Ron Wyden (D-Ore.), JCT chief of staff Thomas Barthold said that to his “best recollection” the Senate has always relied on estimates from the JCT or the Congressional Budget Office, Congress’ other nonpartisan budget analyst. In 2015, Rep. Paul Ryan (R-Wis.) and Sen. Orrin Hatch (R-Utah) decided to keep Barthold in charge of the JCT because of his “strong, nonpartisan” leadership and “objective reports.” But in recent weeks, Republicans have suggested they may rely on a still non-existent—and presumably much more optimistic—Treasury Department estimate. The likely turn away from the JCT and CBO comes after Republicans touted their accuracy on tax issues during the debate over repealing Obamacare earlier this year. “They’re pretty good at dollars; not as good at people,” then White House Press Secretary Sean Spicer said in March, arguing that Americans should believe joint JCT and CBO estimates predicting the repeal bill would cut the deficit but disregard projections that the legislation would leave millions more people uninsured. Ryan, now the speaker of the House, also cited the CBO in March, saying its report on Republicans’ health care bill showed it would cut taxes. Republicans believe that cutting corporate taxes will be revenue neutral because it spurs economic growth, which then increases tax revenue. At first glance, some may find it surprising that a $1.4 trillion tax cut would create only $400 billion of revenue growth. There are a few reasons why that’s the case. For one, the JCT’s analysis assumes that passing the tax bill would lead to an “aggressive” response from the Federal Reserve, which is in charge of US monetary policy. That would likely mean tamping down economic growth by increasing interest rates to ward off inflation. Like other nonpartisan groups, the JCT also takes into account how increased government borrowing slows growth by crowding out private investment. Finally, the United States is already close to full employment and corporate profits are near record highs. 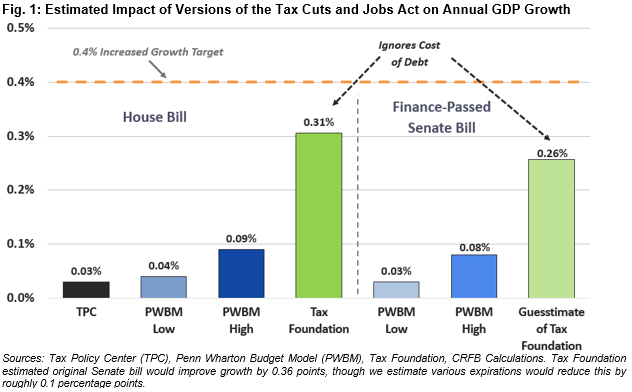 Earlier this month, a dynamic score from the University of Pennsylvania’s Wharton business school found that the Senate bill would add between $117 billion and $368 billion in revenue growth over the next 10 years. The conservative Tax Foundation—Republicans’ preferred tax think tank—projects that the Senate bill would add $516 billion in deficit spending. The Tax Foundation’s model has been criticized by nonpartisan groups such as the Committee for a Responsible Federal Budget for ignoring how debt affects growth. Below is a graph that compares growth estimates from the Tax Foundation, Wharton, and the Tax Policy Center, which is a joint project the Brookings Institution and Urban Institute.. Traditionally, the JCT did not try to predict how a bill’s sticker price could be offset by economic growth. Republicans fought to change that for decades, and they finally succeeded in 2015. The change was widely seen as a way for Republicans to pave the way for tax cuts designed by Ryan. Democrats opposed the switch, saying it could lead to “voodoo economics” justifying huge tax cuts. Thursday’s JCT score shows that the committee has stayed well within the economic mainstream. In 2014, Ryan pushed back against the liberal criticisms of dynamic scoring. “People say it’s dynamic scoring,” he said. “I really prefer to call it reality-based scoring.” Ryan has not yet said if he agrees with the JCT’s analysis. The Corporate Tax Cuts Will Be Permanent. But Your Tax Cut Will Disappear in 2025.